Katie likes to believe she's invisible. It seems much safer than being exposed as she is--shy, poor, awkward. So getting up on stage in the school production of The Taming of the Shrew should be complete torture. But as Katie tells it, something totally unexpected happened when she stepped on stage: "My head exploded. I loved it. Acting hit me like a sucker punch and I loved, loved, loved it! . . . Invisible Katie became visible Katharina." Evan Cooper is, as they say, another story. He knows just what it takes to get noticed, and he uses every one of the skills he's honed after years of being the new kid. Like tossing the keys to his father's high-end Audi to a kid he's never met, first day of school. "I have insurance for car theft," he explains to a shocked Danny. "And there's a full tank." An abuse of the power that comes with privilege and money? Sure. And my head exploded. I loved it. Acting hit me like a sucker punch and I loved, loved, loved it! I was someone else, but as that someone, I was heard and I was seen. Invisible Katie became visible Katherina. Every nerve ending fired and I came alive. You’d think I would have choked and screwed up my speeches. But I didn’t, not once. Unbelievable. I liked being up there, and it immediately became very, very important that I stay up there. Somehow I was more me on that stage than I was anywhere else. I didn’t understand it, but there it was. Katherina is a wild animal that has to be tamed. Give Petruchio something to tame. This is a powerful read. And by powerful, I mean, DEVASTATINGLY SO. I really loved this book, from the first page to last. I loved how readable it was, how captivating and intensely emotional. I absolutely loved the darker undertones of it, and how every chapter, every passage, every sentence of it pulls you deeper into its dark and sticky web of emotional abuse and toxic jealousy. It's a poignant, multilayered, and gripping tale that takes what seems to be a dominant theme in contemporary novels - a love story - and darkens it. At the same time, though, it has its lighter moments, humorous tension-breakers that perfectly balance it out. In other words, it's a truly phenomenal book. I was extremely glad to have discovered it and thoroughly enjoyed reading it. Built around the school production of Shakespear's The Taming Of The Shrew, the plot of Teresa Toten's and Eric Walter's collaborative novel deals with some heavy (but very meaningful) subjects. This whole story - complete with the extremely well-drawn, believable characters - is just brilliant. I mean it. The main protagonists, Katie and Evan, are not only real and convincing, but also very complex. They're not some flat, black-and-white characters, they both have beating hearts, filled with emotions, dreams, fears and hopes. They're not perfect - they're perfectly imperfect, flawed, scared, overwhelmed by their personal problems. They both need love and acceptance, but they go looking for it in all the wrong places. They make mistakes, they get tangled up in each other, messy.. lost. Toten and Walters did a fantastic job capturing their complicated relationship (with all its intensity). I loved it! I thought the character building was masterful, and I just loved it. I especially loved the character growth in Katie. When we meet her, she's nothing but a shy, invisible grey mouse, she doesn't know how to assert herself, prefers to lay low and not attract any attention. And then she gets picked to play the part of Katherine in the school interpretation of The Taming Of The Shrew, and her world begins to change. When Evan asks her out, her heart practically bursts with happiness. At first, she can't even believe it. Evan? The most handsome, fabulous, and disgustingly rich guy in town wants to date her? How could she say no to that? How could she say no to anything that Evan wants from her? Yes, you will probably feel very uncomfortable and anxious once you realize where the authors are going with the story, but you will also stop and think about the massage this book carries and how well the brilliantly weaved plot gets it across. This is not a happy first-love story and it shouldn't be approached as such. It's an eye-opening, thought-provoking, unsettling story that will stay with you long after you turn the last page. What I loved the most about this book, though, is that although it's a dark tale, it's also one that ends with hope. I loved seeing the transformation that Katie's character underwent towards the end of The Taming. I liked that she became this strong-willed, assertive girl who could stand up for herself. I absolutely loved that she didn't let Evan break her, overpower her, tame her. And she didn't need saving, she found the power and will to save herself. I also loved that the authors didn't make Evan to be this one-dimensional bad-guy. Instead, they provided enough background story and insight into his past for the reader to better understand his motives. That, of course, didn't make him a good guy, but it definitely made it harder to hate him. I came out of reading this book disturbed, with my head spinning, and very satisfied with its conclusion. I also felt a great deal of sympathy, and not only for Katie, but for both of them - for totally different reasons. If all that doesn't make a great read, than I don't know what does. Teresa Toten and Eric Walter make a magnificent writing duo. They do awful and dark so well, and they get under your skin so deep, that you feel like taking a shower after reading some of the chapters of this book. It's draining and disturbing. Most of all, though, their writing is just absolutely fascinating. At least it was to me, I'm sure not everyone feeds on sad and scary as much as I do, but what can I say? I like my books to be dark, creepy and powerful. And the reason for this book being so sad and scary is simple: it's just all too real. It's disquietingly authentic, and that kind of authenticity is bound to resonate deep within. Random House Canada has generously offered to give away one paperback copy of The Taming to a lucky Canadian winner! 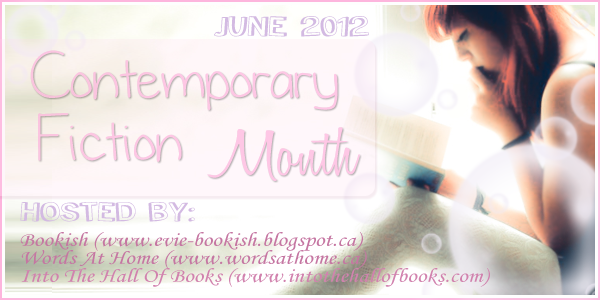 This review is posted as part of the Contemporary Fiction Month feature! I'm glad you loved it! This one is already on my wishlist, and I want to read it so much, especially after reading this amazing review, 'cause it sounds like a book I'll fell in love with... Thanks for the review!!! Super intrigued. I haven't read The Taming of the Shrew in a few years so I probably need a little review. This sounds interesting. Just finished reading The Downside of Being Charlie. And I have to say, I'm craving for more contemp goodness. Loved the way you reviewed this. This might be perfect for me. Great review! I am so putting this on my TBR list ... awesome review! I love discovering new books that I hadn't heard of. I have been getting more into contemporary lately so I am super excited that you are doing contemporary month. I am looking forward to discovering some really great books. Fabulous review. This sounds like a great read. Yet again, another amazing review Evie! I'm really interested in this one - it sounds like it adds a lot of complexity to an intense situation by making things not so black and white and having compelling, believable characters. I'm curious as to how the storyline progresses, it seemed to really grab hold of you! I like dark, creepy books, but when they are meaningful, it is just so much better! I'm not sure I like dark and creepy in a novel though. The story sounds so intense! I like that it's an emotional read and often it'll help me connect more with the characters. The plot sounds like it has many layers and I hope they'll work together well. I appreciate the fact that you were able to present how mucj you liked the book and nary (?) an exclamation mark in sight! Congratulations!! You definitely got my interest. This looks sweet! I'm so buying this if I don't win it! Gotta go at the top of my TBR list!! I love Shakespeare retellings (I've actually written one!) and this one sounds amazing! Thanks so much for the chance to win! OMG!!! I love the play The Taming of the Shrew. Its kind of creepy that they end up happy, but I am definitely going to read this one regardless of how I have to get my hands on this!! First of all, can I just say "Wow" to you for such an incredible review. Honestly, wholeheartedly, this is the best review that I have ever read for any book, at any time in my life. Your review of The Taming made me want to go straight to Amazon and buy this book and not sleep, eat or drink until I finish it. Seriously. You have an amazing talent Evie, and you should be proud of yourself for it. The authors you review for should be proud of it as well. Just...Wow! About the book! I got your daily blogmail yesterday and saw this title for the first time, read the synopsis, and knew I would be reading this book at some point. I have never read a book that has a focus on abuse before and I think that this is definitely the one to start with. The authors, according to your review, have an incredible talent for bringing to the forefront every emotion, good, bad and ugly. They do not make light of how serious this issue is. I am very much looking forward to this book. Thank you so much, again, for your incredible review. And thanks to the authors for such an overwhelming, emotional, heartrending, book. I saw this at Chapters the other day, but as I am broke currently, the book ultimately had to be set aside. BUT I'm happy for this giveway because of the chance to win myself a copy. Awesome review, thanks for this giveaway!! This is the second good review I've read of this book. I love how you describe is as a powerful read. I may have to look into checking it out! I haven't heard about this book. It sounds amazing. I'm glad that there seems to be no love-triangle from what your review says. Definitely adding this to the TBR list. Thanks for the giveaway. I'm starting to feel as YA Contemp is becoming my second favorite genre. All these books I'm discovering are getting me lost in an awesome, yet powerful genre. Anything that involves something to do with Shakespeare has got to be good, right? I'm loving this synopsis! OMG I want to read this book so bad. This is on my TOP TRL and I hope to win! I'm dying to read this! Eric Walters was always such an important part of my childhood. I just added this to my TBR pile thanks to this review. I used to hate to read plays, but I learned to loved them once I read Romeo and Juliet back in the 8th grade. Anything with The Taming of The Shrew has to be amazing, right? It sounds like a bit of a dark story and a very emotional read! The Taming of the Shew is mentioned in this book? Then I'm totally there! That's my favourite Shakespeare play! Oh! I'm glad you liked it! I love devastatingly powerful books! They get so intense, as you said, which I LOVE!. And darker undertones are always welcomed! I love books that have important messages incorporated in them! I love how emotional this book is. Thank you for the review. I am definitely going to check this book out! Wow, your review made ​​me want to read this book.